Our Brains play a big role in our emotional and energy balance in business, and are affected by external stimuli. Our Optimistic or Pessimistic thoughts are nourished in our brain and are affected by our environment, and are enhanced by the visuals and sounds in our homes and offices. 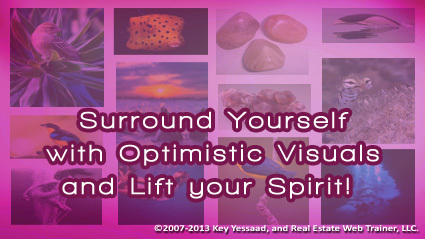 If you desire to jolt in your optimism surround your workspace with optimistic happy pictures; photos of your family; photos from your vacations; beautiful scenery pictures or art that you love. You should also be aware that our brains store images and create ‘object blindness’ when objects have not moved – so move your visuals around every couple of months, and add and change them as well. Add to your list a group of positive people that you enjoy chatting with, and make a point of reaching out to them; their optimism will rub off on you and that will jolt your inner energy to accomplish more.